CARBONDALE, CO FEBRUARY 14, 2013 Stephen Watson, driver of record for Offroad Design #4488, and brother / co-driver Brandon Watson gave the 2013 Griffin King of the Hammers their all for 14 hours with no giving up. Two issues plagued their day, the first a broken spindle on a D60 front axle putting them down for 3 hours, and then the pinion yoke was damaged and the driveshaft came out about 40 miles short of the finish timing them out of the race. This is the first time in 5 years they have not finished the ‘toughest race’ on US soil. “We were running a strong pace all day, but with the three hours of down time we essentially timed out,” said Stephen Watson, driver and owner of Offroad Design. “Dave did good! I still can’t believe that we pay people to do that to us,” he laughed about Hammerking Productions brutal 182 mile course. With multiple finishes between the brothers they had the process of the full week under control. “We showed up early enough to have the all of Friday to pre-run as soon as the course was open, and with the day off on Sunday for the Moto race, we had a day to recoup before the week. That and not having any real issues on the car made the week manageable,” said Brandon. The experience really began in the beginning of January when they installed new 3.0 King bypass shocks and went to tune with Wayne from Alltech Motorsports. After a tumble in the dirt from a front pinion bearing seizing up, they left with a car that was an amazing amount faster than with the old shock package and could be driven much harder with out upsetting the suspension. “Racing is hard on stuff, but it lets us find and fix weak links so they never arise in the recreational wheeling world that Offroad Design works in, which makes it all worth it,” said Stephen. The brother’s qualifying time was 4:42:53 putting them 65th off the line and they immediately started clicking off miles and passing cars using the pre-run knowledge of fast lines and the car’s new found desert speed. They had a great time swapping positions with Derek West up to race mile 42 and the first hard climb, which they bounced right up. After passing through the main pit they decided to put off the trip up Back Door to keep putting cars behind them in the desert and headed around the mountains to the Aftershock trail. “As we’re working through the rocky washes I started feeling the brakes acting up and after running through a lot of potential scenarios we stopped at the bottom of the Devil’s Slide and found a broken spindle on the D60 front axle. Once we knew we would need parts from our pit to fix the car I stripped down to my nomex long underwear and started the long run up the nasty rock crawling trails and steep dirt hills to meet our crew at the pit. This was almost a 7 mile round trip with no reason to sweat in a thick heavy firesuit. If you hear stories about some guy running up the trails in his underwear, now you know who it was,” laughed Stephen. “We completed Wrecking Ball as the last of the truly hard trails and were looking forward to an easier drive to the finish but as we followed another car down Clawhammer waiting for a chance to pass, we heard the dreaded CLUNK of the rear driveshaft flopping around. The pinion yoke was damaged at some point in the race and came apart about 40 miles short of the finish. We managed to limp the car down to the bottom of that trail in front wheel drive but were out of time before the race cutoff to get to the pit for the parts to repair the problem. At that point we called the race and drove the car back to town on just the front wheels. This was Team Offroad Design’s first ever DNF. We did leave Johnson Valley knowing we are capable of running a strong pace and knowing we ran hard the whole race (sometimes literally running) and just came up a little short on time,” finished Stephen. Anyone seeing an Ultra4 car on the line should understand that there is a huge amount of work from a lot of people getting it there. “We worked with a giant list of people to put a solid car on the line for the biggest race of the year. We need to thank our Dad and Crew Chief, James and the rest of the pit crew who all traveled a long way, put up with some dusty and noisy lakebed living and worked into the night for the first time ever helping us get as far as we did.” The rest of the crew that helped them through a strong race included people like Randy and Cottin Rodd from Jimmy’s 4×4 who delivered a fresh transmission, Scott at Bighorn Graphics making sure everything looked good, Tom Wood’s guys making sure the driveshafts are ready to flog, Amsoil working on an even more improved fluids package and all the other amazing companies that support us including Offroad Design, Goodyear, PSC Steering, King Shocks, Baja Designs, Pacific Fabrication, Superior Axle, TrailReady Wheels, ARB, Tom Woods Custom Driveshafts, Reid Racing, Dynomax and Optima. These are folks we work with every day at Offroad Design putting together vehicles of all sorts that just flat work right. In 2012 they finished the King of the Hammers in 12th place, giving them a top 20 starting position in this years 2013 event which they unfortunately did not finish. Also in 2012, they finished top 10 in all the other races this year. To reflect on past years: 2009 they were 5th in LCQ and finished 13th in the main race. In 2010, they qualified through a 2nd place finish in BITD Vegas to Reno and both Stephen (in the Pacific Fabrication car) and Brandon, raced with Brandon taking a 18th position finish. With the top 20 finish they were automatically qualified for 2011 where they broke in Aftershock but still finished in the top 30 and Stephen Watson was awarded the Sportsmanship Award. 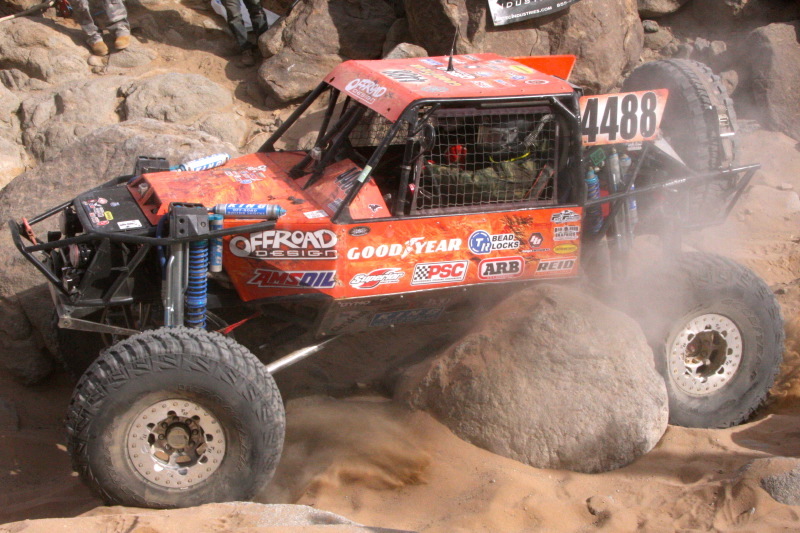 To run the 2012 race they qualified through the Glen Helen event and finished 12th in the King of the Hammers. The Watson family is very supportive of the Off Road industry and racing world. The entire family and crew is volunteer basis whom are very appreciated in these heroic one day experiences. About Offroad Design Racing: The Offroad Design racing team is a family affair with brothers Stephen and Brandon Watson in the cockpit and father James Watson as their crew chief. They have successfully finished four King of the Hammers races with strong 12th, 13th, 17th and 28th finishes and finished 2nd in the 2009 1000mile BITD Vegas to Reno 3 day race. The Offroad Design Ultra4 rig is built with the exact same race proven parts that they use to build customer vehicles. Stephen is president of Offroad Design which manufactures and sells offroad equipment largely for fullsize trucks, James is co-owner at ORD and handles the manufacturing shop and Brandon is a project manager for a large commercial and high end residential contractor in the Aspen area.